Credit: Flickr/Cogdogblog. CC BY 2.0. The solidarity economy is a global movement to build a post-capitalist world that puts people and planet front and center, rather than the pursuit of blind growth and profit maximization. It isn’t a blueprint but a framework that includes a broad range of economic practices that align with its values: solidarity, participatory democracy, equity in every dimension including race, class and gender, sustainability and pluralism, which means that it can’t be a one-size-fits all approach. Nevertheless, the notion of buen vivir, or living well and in harmony with nature and each other permeates everything the movement does. Some of these practices are old and some are new; some are mainstream and others are ‘alternative.’ Solidarity economy practices exist in every sector of the economy: production, distribution and exchange, consumption, finance and governance/state. People often think about cooperatives and credit unions which are collectively owned and managed by their members, but they are just one example. 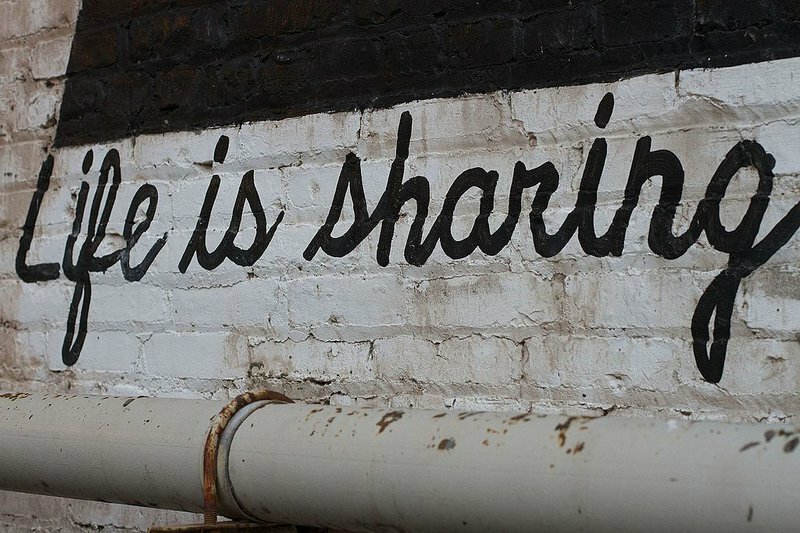 Others include community land trusts, participatory budgeting, social currencies, time banks, peer lending, barter systems, gift exchange, community gardens, ideas around ‘the commons,’ some kinds of fair trade and the sharing economy, and non-monetized care work. The idea of the solidarity economy is to build on and knit together all of these practices in order to transform capitalism by lifting up and encouraging the ‘better angels of our nature.’ Rather than making a virtue out of the pursuit of calculated self-interest, profit maximization, and competition—the things that underpin capitalism—this economy nurtures our capacity for solidarity, cooperation, reciprocity, mutual aid, altruism, caring, sharing, compassion and love. Increasingly, research across many disciplines has shown that we are hard wired to cooperate—that in fact, the survival of the human species has depended on our ability to work together. If this sounds like something you want to support, here are seven ways to help build the solidarity economy. 1. Increase self-provisioning and community production. Throughout history communities have grown and foraged for food; built roads, irrigation systems and housing; developed medicines and made clothing, furniture and art in order to sustain themselves. But under capitalism we are incentivized to buy all this stuff and so need jobs to earn money in order to pay for it. Since the 2008 global economic meltdown there have been increasing fears about the instability and fragility of this kind of economy. Add to this the projection that 40 per cent of jobs in the US could be replaced by Artificial Intelligence and automation and it becomes even more urgent to think about how communities can provide more for themselves in order to survive impending economic collapse or massive job destruction. Community production includes low-tech ways of meeting needs like growing food and raising chickens in community gardens and ‘edible’ urban landscapes, as well as swap-meets, mutual aid networks and skill-shares. But it also extends to democratizing cutting-edge technologies. In Detroit, for example, (where some communities have been living with massive joblessness for decades), the James and Grace Lee Boggs Center to Nurture Community Leadership and Incite/Focus, a ‘fablab’ that puts cutting-edge fabrication technology into community hands, support a whole spectrum of community production experiments from permaculture, swapmeets and skillshares to 3D printed buildings and digital fabrication using Computer Aided Design (CAD). If you have an account at a big bank, consider moving your money to a local credit union. Credit unions are financial cooperatives that are owned by and run for the benefit of their members—the account holders. Better yet, find a community development credit union which is committed to serving low and moderate income communities. Credit unions are just like a bank in that you can open up a savings or checking account, get an ATM/Debit card, and take out a loan, but (on the whole) they have not engaged in the kinds of predatory lending and other financial shenanigans that crashed the economy in 2008. 3. Invest in or gift to new economic institutions. There are a many ways to support the solidarity economy financially. For example, ‘Direct Public Offerings’ (DPOs) have become a popular and successful way to raise capital for co-ops. DPOs reach out to the community to find investors who are willing to accept relatively low rates of interest because they believe in the mission of the enterprise. Lending circles, an age-old practice that has become increasingly popular, bring together a group of people who contribute a set amount each month, and each member gets a turn to receive the whole pot of money at zero interest. There’s also the option of participating in crowdfunding campaigns or gifting money and other forms of support to solidarity economy organizations and networks. 4. Prioritize housing for use not speculation. Our current real estate system leads to crazy outcomes. At a conservative estimate, for example, over half-a-million people in the US sleep on the streets each night even though there are 5.8 million vacant units (excluding seasonal and for-sale housing). One reason for this mismatch is that housing has increasingly become a speculative commodity—an asset to gamble with for huge potential gain—rather than to meet human needs. Not only does speculation add to the housing shortage by keeping units off the market and driving up prices, it can also implode, as it did spectacularly in 2008, leading to a global economic meltdown. If you are looking at housing options, consider ‘limited equity’ housing like community land trusts and some housing co-ops and co-housing developments that take housing out of the speculative market. In these approaches re-sale prices are capped in order to maintain affordability. Concerns have been raised about preventing low and moderate income people from building wealth through real estate appreciation in this way, but it is the limited equity model that makes prices affordable in the first place. 5. Be your own boss—look for a job in a worker co-op or start your own. Worker co-ops are owned and managed by their workers, who decide how to run their business and what to do with the profits—share them, reinvest them in the enterprise, and/or allocate some of them to community projects. This is in contrast to a capitalist business where the owners capture all the profits generated through the labor of the workers—a process of exploitation as well as class struggle. Some cities like New York and Madison, Wisconsin, are investing millions of dollars to incubate and finance worker co-ops as part of an inclusive economic development strategy to create jobs and wealth building opportunities in low-income communities and communities of color. If you’re interested in this form of economic democracy you can look for a job in an existing co-op or start your own. That’s challenging but there’s a growing support system that provides co-op training programs and other forms of support to help you navigate your way. 6. Connect with and talk to others in the emerging economic system. If you’re interested, learn more about what’s happening and consider joining the U.S. Solidarity Economy Network or RIPESS (the Intercontinental Social Solidarity Economy Network) for other parts of the world. If you’re a writer then write about it; if you’re a student, study it; if you’re a teacher, teach about it; if you’re an activist, nudge your organization to adopt a solidarity economy framework. If you’re a politician, then promote policies that support it; if you’re already involved in an institution like a co-op, find ways to connect with others to build supply chains that work on solidarity principles. There are a million ways to help make the solidarity economy stronger and more visible. Even just talking about it is valuable. Capitalism nurtures competitive, calculating, and self-interested values and behavior, but Elinor Ostrom (who won a Nobel prize for her work on the commons) and others have documented how community-managed resources like forests, fisheries, pasturelands and water can be managed more efficiently, sustainably and equitably than those in private hands, provided that there are rules and enforcement mechanisms to prevent anyone from taking unfair advantage. We need to build an economy that is premised on the whole of our beings and that leans towards solidarity in this way. We are all engaged in the valuable social and economic work of providing care for our children, elders, neighbors, and communities—not for money, but from our innate capacity for love, friendship, reciprocity, caring and compassion. So recognize that the solidarity economy is all around you and that you already live it. Nurture your better angels and live it well. To learn more about the Solidarity Economy and the global movement to realize it, visit http://www.ussen.org.